Anyway, enough ranting about buttons. There were about 5 people waiting in Watertown (including us) for the 52, one of whom seemed a bit... off. After laying over for a bit, the 52 finally came to the stop, and we got on. The route starts out following the other buses from Watertown Yard (not square) down Galen Street. There are some businesses and a few residences on this stretch, but it's pretty urban, overall. Upon reaching the Mass Turnpike and Newton Corner, it makes a turn around the impressive facade of the Crowne Plaza hotel (yes, the same Crowne Plaza I stayed at in Orlando), and then heads down Centre Street. The 52 is the only bus serving this stretch, with the other buses turning on Washington Street towards Boston. The part of Centre Street just south of Newton Corner is much more suburban and residential. After passing by a branch of Boston College, the bus crosses Commonwealth Ave and comes into Newton Center. It's more urban here as the bus connects with the Green Line "D" Branch. Note that at this point, the bus splits into two routes: more often, it goes via Parker Street, while occasionally (and on our trip), it goes via Winchester Street and Newton Highlands station. There's a nice view of Crystal Lake as the bus crosses the Green Line tracks and things get suburban again. Some businesses pop up as the bus enters Newton Highlands. Note that the 52 actually stops a block away from the station itself, while the 59 (also from Watertown, with a better schedule) directly serves it. After this, the 59 splits off from the 52 onto the more urban corridor of Needham Street, while the 52 goes on the suburban Winchester Street. The stops are very spaced out as the bus cuts through a country club. As the bus turns onto Nahanton street, it goes by that farm I mentioned. It then turns again onto Dedham Street, meeting up with its Parker Street route. There are more residences as the bus turns again onto Wiswall Road, serving a little neighborhood as well as Mount Ida College. There's a turn onto Walsh Road and again onto Saw Mill Brook Parkway. It goes by a little plaza before turning again onto Fredette Road, again onto Spiers Road, and finally back onto Dedham Street, now called Baker Street. There's some cemetery cutting here, the only other MBTA bus route besides the 30 that cuts through a cemetery (as far as I know). Surprisingly, the bus is in Boston now, but based on the surroundings you wouldn't know it. The route passes some small businesses and a power plant, crosses the Commuter Rail tracks, and turns onto Spring Street. At this point, some 52 trips terminate at the Charles River Loop. Our bus, however, was going to the Dedham Mall, so we turned again onto VFW Parkway. The bus passes by (but doesn't stop at) some businesses, and VFW Parkway becomes Providence Highway. 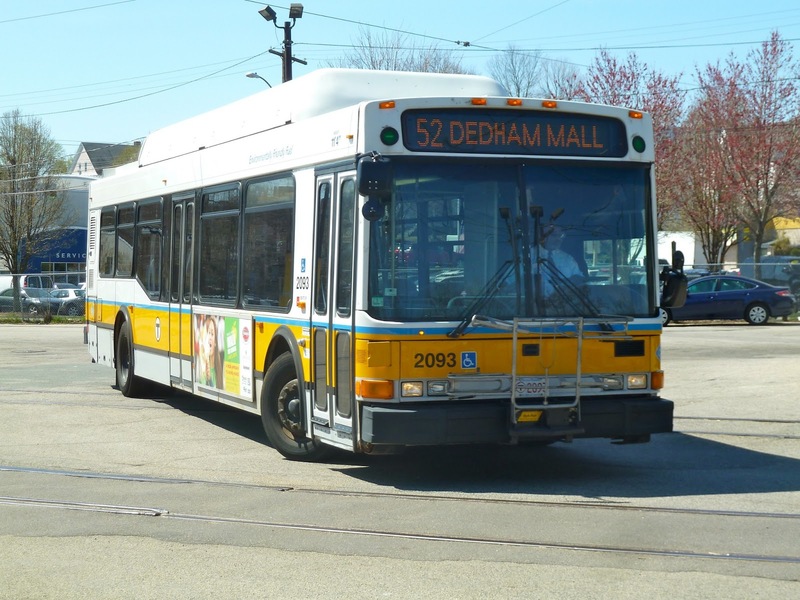 Finally, the bus turns into Dedham Mall and makes two stops: "Dedham Mall," and "Dedham Mall at Stop & Shop." Here, the bus lays over for a bit before making its journey back to Watertown. The 52 in Watertown. The destination screen malfunctioned and showed nothing by the end of the ride. Ridership: In this case, shoppers. A few people rode from beginning to end. There were some high school girls (being April vacation) who got on in that neighborhood where the bus breaks off of Dedham Street who were talking annoyingly loud. Overall, I'd say about 15-20 people rode, which isn't a very good amount for a weekday. Pros: Cuts through a huge part of Newton not served by other buses. It's the only bus to serve Newton Center, which is a big plus. It also showcases a part of Boston you never knew existed. Cons: The schedule, of course. Admittedly, not many people rode, but if the route had Saturday service, people might use it to shop at the Dedham Mall. Nearby and Noteworthy: A lot of houses. The Dedham Mall seemed like a nice enough mall, but we only visited Five Guys Burgers and Fries. As you can probably tell from the link, it's just a fast food joint, but the hamburgers are good. Though the schedule is less than ideal, the 52 serves a lot of neighborhoods not served by other MBTA buses. There are some interesting things to see, like the farm. Just remember that the bus leaves from Watertown Yard, not Watertown Square. It's easy to get the two confused. Latest MBTA News: This weekend (May 4-5), there are Blue Line shuttles (scroll to the bottom of the linked page) between Airport and Wonderland. There might be some minor delays on the Orange Line in the coming months because of platform work at Oak Grove. Also, I'm taking a trip to the MBTA Control Center tomorrow! I hope I'm able to take pictures, as I want to write an extensive blog post about the visit on Sunday. Thanks for mentioning the Watertown Square/Watertown Yard intersection. Because you have to cross diagonally, there are 2 busy streets to cross. You simply have to dodge cars to cross it or the dread of possibly missing your bus gets too powerful. Luckily, the traffic is so bad, cars aren't moving too fast. I can't think of any cheap solution but it's nice to get a chance to gripe about it. On the positive side, you cross a tiny bridge which goes over the Charles River at a place where it's more of a stream. Kind of a nice view. Yes, it's a very annoying intersection to cross. Though I don't remember exactly where, there's a place in Watertown Square where you can go down to the river at a nice little dock. It's very nice and peaceful down there. I might do a review of Watertown Square at some point. THey could A: Combine Watertown yard and square, or create a pedestrian bridge or tunnel. The bus passes by my school, Oak Hill and it specifically comes in for it. It also passes by Brown which is literally across the street from us. I'd say about 1/8 of people from school go on the bus, but it is also popular on Tuesdays to get to Newton Center.